Track sleep with your Apple Watch automatically. No buttons to press. Just wear your Watch to bed and wake up to AI-powered, personalized insights about your sleep. Automatically log your data and follow your sleep trends with powerful trend tools. Don't have an Apple Watch? Sleep Watch can be used without a Watch by logging your sleep manually. free to use as shown. All results are estimates only. Do not rely on SleepWatch for medical advice or diagnosis. Wear your Apple Watch to bed. Upon waking, check the Apple Watch App or iPhone app to see your auto-detected sleep details; that's it! We recommend scheduling 'Do Not Disturb' to turn on automatically during your typical sleeping hours to prevent any Watch notifications from disturbing your sleep. This can be done in the iPhone Watch App > My Watch > General > 'Do Not Disturb' section. We also recommend enabling 'Theater Mode' while asleep to keep your Watch screen dark until waking. Updates Feed : Take control of your sleep habits with AI-powered, personalized insights. Every body is unique. Using artificial intelligence, Discover uncovers from your data the lifestyle choices you make that appear to be helping you achieve a better night's rest. The more data you track with SleepWatch, the more you can Discover. Sleeping Heart Rate Dip Tracking: Studies among particular populations suggest that the more heart rate slows—or "dips"—during sleep compared to waking may be better for both overall and cardiovascular health in years to come. Get motivated to build a healthier lifestyle and start tracking your sleeping heart rate dip today. 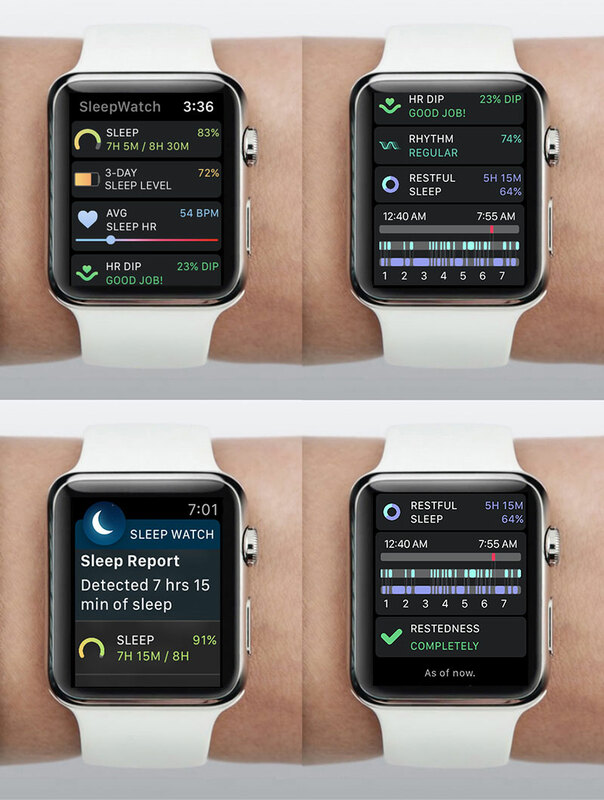 Ranked: SleepWatch has often been one of the top health apps and top apple watch health apps. Apple Watch Features: Supports many Apple Watch 4 health features, including heart-rate, activity, etc. We also support for sleep tracking: Apple Watch (Original), Apple Watch Series 1, Apple Watch Series 2 and Apple Watch Series 3. Do not rely on SleepWatch for medical advice or diagnosis. SleepWatch is not a replacement or substitute for professional medical care. Use SleepWatch for informational, general wellbeing and fitness purposes only. SleepWatch results are estimates only. Consult a doctor if you have any health concern or before starting any exercise program. Do not self-adjust medications. SleepWatch is known for its hassle free auto-detection of sleep via the Apple Watch, but many don't know that SleepWatch can be used without a watch. Here at SleepWatch, we have a keen interest in keeping up with the latest in sleep news and innovation. This week's articles cover tips things you can do throughout the day to improve your sleep, whether you can really “catch-up” on sleep, and falling asleep and staying asleep. For your reading pleasure, here are some of the articles the team has found interesting this week. The latest season of your favorite show just dropped for streaming, and it turns out every episode ends with a cliffhanger. Suddenly, you look at the clock, horrified at how late it got. The next day, your alarm buzzes. It’s wake-up time. You’re groggy and dragging yourself out of bed seems like the last thing you want to do. Sound familiar? We’re happy to announce new features to help you regain control. For years people have been under the impression a drink after work or a nightcap at bedtime would help them relax or perhaps better yet get a good night’s sleep. In fact, 20% of Americans currently use alcohol as their preferred sleep aid. Scientific evidence points to the fact that alcohol has complex effects on our sleep and in aggregate is detrimental to our health. Anxious Because You Can't Sleep or Can't Sleep Because You're Anxious? Here at SleepWatch, we have a keen interest in keeping up with the latest in sleep news and innovation. This week's articles cover the connection between sleep and anxiety and whether your fluffy companion can improving your sleep. Did you know that by simply going to bed and rising at the same time daily (Sleep Rhythm) you might be able to gain significant benefits? Sound too good to be true? Well, there's science behind those possibilities. SleepWatch has undergone many changes since launching. Here’s a look at our newest addition. In our continuing efforts to improve SleepWatch for our all of users, we are excited to announce some new features that we hope will improve your insight into sleep. You'll get feedback on the changes you are making with us and see how your data compares to SleepWatch users across the globe.